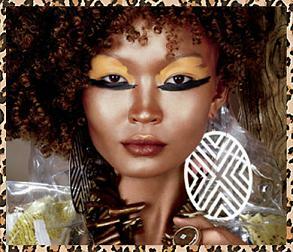 MAC have just launched a new range called Style Warrior. Inspired by this summer’s global/tribal trend, right down to the packaging, it has everything you need to create a shimmer, bronzed look. The Bronzing Powder comes in a compact with a mirror with a tribal design, and is perfect for using as a highlighter on cheeks and collar bones. It costs £14.68. MAC have also developed a new product for on/off tanning – Lustre Drops (£13.21). Being a liquid means it easily rubs in for a smooth finish, and you can get it exactly where you want it. And it’s not just the face that’s getting the bronzing treatment – MAC have branched out with this Skinsheen Leg Spray. It’s a gel that can be applied with a brush to eliminate streaking, and will give a subtle glow. It costs £15.66. Check out the new Style Warrior range over at the MAC website now.